The name is a real mouthful so from now on we’ll just call it the BUEI. Opened in 1997, the BUEI’s purpose is to enhance our understanding of the mysteries of the ocean. Set in an impressively constructed modern building, it accomplishes this through a series of exhibits, many of them interactive. It’s a great attraction for families and kids and a good option for a rainy day. Visitors enter on the upper floor. A life-size replica of a 500 pound, 27 foot long squid hangs in the entrance hall and reminds you that it’s not just pretty fish that live in the ocean. One of the highlights on this level is the amazing collection of shells collected by a local man, Jack Lightbourn. There are over 1,000 shells on display, less than one quarter of his entire collection. The Teddy Tucker Shipwreck Gallery showcases many of the items discovered by its namesake, a renowned Bermudian diver, archaeologist, and honorary chairman of the BUEI. Among its many exhibits are ampoules of opium from the Constellation which sank off Bermuda in 1943. The wreck inspired Jaws author, Peter Benchley, to write his novel The Deep. 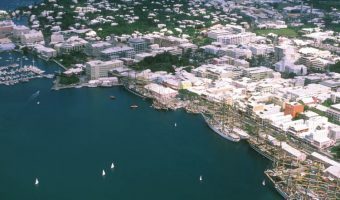 The subsequent movie, starring Jacqueline Bissett and Nick Nolte, was shot largely on location in Bermuda. The Treasure Room displays gold, coins, and other items recovered from some of the hundreds of shipwrecks around Bermuda. One of the most interesting items on display is the replica of the Tucker Cross, a gold cross recovered by Teddy Tucker in 1955 from the wreck of a 16th century Spanish ship. 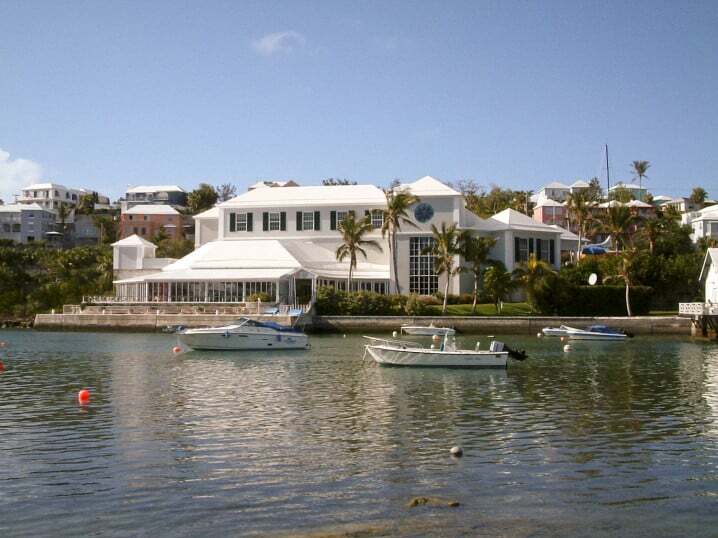 In 1975 Queen Elizabeth II visited the island and opened the Bermuda Maritime Museum. Teddy Tucker was supposed to show her the cross, but on unpacking the box discovered that it has been stolen and replaced by a plastic replica. Since then the cross has not been seen or heard of. A recreation of the cross is now on display. Another highlight is a full size replica of the Bathysphere. It was in this steel spherical device that Charles Beebe submerged to a depth of 3,028 feet off the coast of Bermuda in 1934. The dive smashed the previous record depth for a human dive (525 feet) and stood for 15 years. Also on show is an Exosuit. Similar to an astronaut’s suit, but constructed from titanium, it allows divers wearing it to reach depths of 600 feet and can be used for rescuing the crew of sunken submarines. If you need to eat, the BUEI offers a fine onsite restaurant. The Harbourfront boasts magnificent views of Hamilton harbour and offers steak, seafood and sushi dishes. The BUEI also has a lovely gift shop with and is fully wheelchair accessible. Admission to the BUEI costs $15, $12 for seniors, and $8 for children (7 to 17). Kids aged 6 and under enjoy free entry. 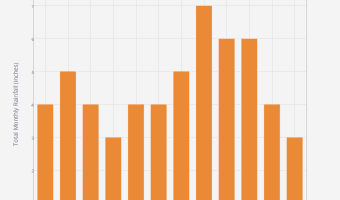 The attraction is open every day of the week. Opening times are 10 am to 5 pm daily. Last admission is at 4 pm. The BUEI is situated on Crow Lane in Pembroke Parish (the eastern continuation of Front Street). It’s an easy 5 to 10 minute walk from the centre of Hamilton. Several buses stop outside the facility; #1 (Hamilton to St George), #2 (Hamilton to Ord Road/Warwick Parish), #7 (Hamilton to Dockyard) and #8 (Hamilton to Dockyard). There’s free parking outside for those travelling by scooter. 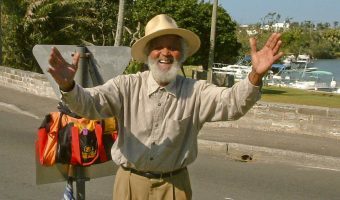 If you’re visiting early in the morning you can combine your visit here with a trip to see Johnny Barnes, the friendliest man in Bermuda. Every weekday morning he can be found at the nearby roundabout. Waterville and Fort Hamilton are also close by. Map showing location of Bermuda Underwater Exploration Institute. Diving legend Teddy Tucker passed away at the age of 89 on June 9. Condolences to his family from Bermuda 4u. This is a well-designed museum/educational facility. We went last month and found the lionfish exhibit particularly interesting. Well worth the money, but save it for a rainy day activity if you can. The simulated dive was a hoot, if a bit hokey. The exhibits are very interesting and well worth the (mile long?) walk from the main tourist area on Front Street. The BUEI is a nice museum with pretty views of the harbor. The simulated dive is a little disappointing though.